1.) 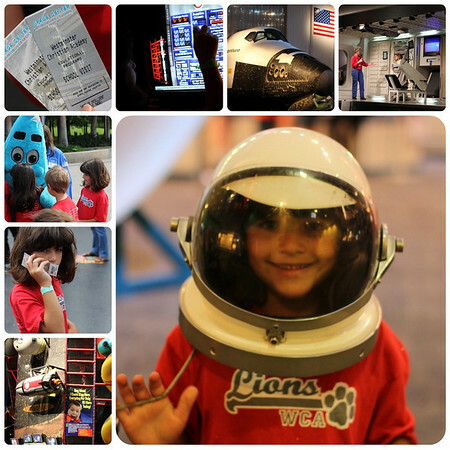 Guess who went on a field trip to Space Center Houston yesterday? Was it Annelise? And was I one of the driver/chaperones? And was it really fun but still kind of the longest day ever? 2.) "You know, I have to tell you, your daughter doesn't look like you. Do you hear that a lot?" Yes, that very phrase was said to me yesterday by the mom riding with me in my car (!!!) and basically spending all day in my vicinity. Yes, I managed to keep it together and not go all kinds of crazy on her. Imagine me just shaking my head a bit to try and comprehend such a rude statement and then just smiling and doing my weak laughter thing followed by a murmured hmmm and then trailing off (which is effective but not as satisfying as pulling hair). I decided not to explain the whole WHY she doesn't look like me because I did not feel she deserved an explanation. 3.) Have I told you I hate having to pack a sack lunch for myself? I really think at 42 I am past a sack lunch. So I compromised and took California rolls and a sliced pear. 4.) On a slightly gross note, I completed my saliva test this morning and sent it off on its merry way. I'm quite curious to find out the results (which will hopefully be soon). 5.) Who just got back from Florida barely two weeks ago and was heartbroken they missed seeing the shuttle launch? Was it us? And who found out they got bumped up to VIP status and will get to view the upcoming launch Monday morning at a much closer location and possibly rub shoulders with the astronauts' families and various other space-y bigwigs? Who's about to spend a jillion hours in the car again driving to Florida and back? Who has kind of lost their respective minds? Happy weekend, my friends. I'll catch y'all on the flip side. Do deserve it! Go watch that launch!!! At least you are now a fully experienced road-tripper. In regards to #2... bird leg up and ready to fight! In regards to #5... AWESOME!!! have fun!!!!!!! It's not quite the same thing - but here's another thoughtless comment for you "Ava thought my daughter was you". Um, great. As if I don't have enough guilt over having to be a full-time working mom, now you're telling me that Ava doesn't know who I am. I'm with Kim...The nerve! And where does this person live? ha! I also hate making lunches for myself. I laughed out loud when you said you were so over that. Um, I totally agree. 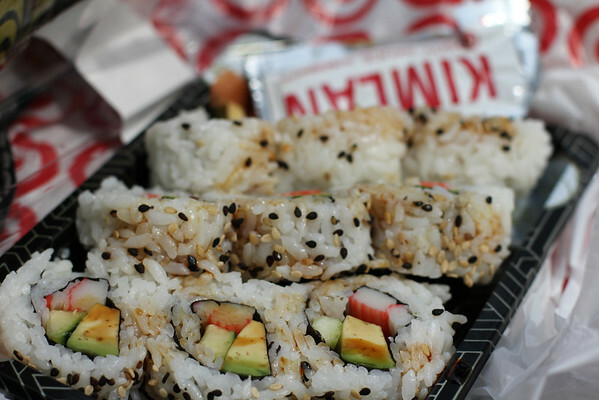 I like the sushi for lunch...I might have to try that next week when I go on the 3rd grade field trip. Y'all have a safe trip to Florida! I am so happy you are going to get to see the shuttle launch! Fun times! Won't that be a fun story to tell. Florida 2 times in a month. ha! For some reason this post has turned into a novel. Oh, well. that's my kind of luncgh, yum! people say the rudest things and have no clue. on the other hand, people often say the kids look just like kim when in reality they look NOTHING like her. sorry, they may have her mannerisms because she has raised them but they don't look at her at all. makes me wonder why if people don't know what to say they can't just be quiet. i agree that you owed that woman NO explanation. being room mother for griffin's kindergarten year made me feel like i fulfilled my motherly field trip duties. for life, right? !